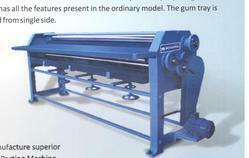 Our product range includes a wide range of four roller pasting machine and paper four roller pasting machine. 62" 150 1.0 700 88"x42"
72" 150 1.0 750 98"x44"
84" 150 1.0 800 110"x47"
With the help of our experienced professionals, we are able to manufacture superior quality Four Roller Sheet Pasting Machine. 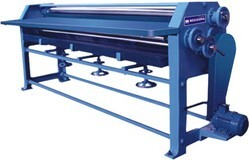 These Four Roller Sheet Pasting Machine are huge demand in the market due to high quality and durability. This is a special gum saving model in which the 4th roll is used for extremely accurate application of glue on the tips of the corrugated surface of paper or board.